Competitors were met with yet another dry, sunny evening for the third qualifying session. Conditions were described as dry and clear all the way around the course although the lack of adhesion flags were on display at Cronk y Voddy, the 23rd Milestone and Guthrie’s. Guy Martin and James Hillier had the honour of leading the field way at the slightly later than scheduled time of 6.31pm and they were followed by Ryan Farquhar, Ian Hutchinson, Cameron Donald, Dan Kneen, Michael Rutter, Bruce Anstey, John McGuinness and Ian Mackman. All were on their Superbike machines with the exception of Kneen and Rutter who were Superstock mounted. Meanwhile, Conor Cummins got his campaign underway, setting off on his Superstock machine half way through the field. Hillier had problems though pulling off the course before going back out on his Superstock machine. Martin was first man back at 127.115mph swiftly followed by Michael Dunlop at 126.03mph and Farquhar on 125.197mph. Gary Johnson, Donald and Rutter were also over 125mph but Martin’s time was bettered by McGuinness who lapped at 127.385mph. Anstey was the quickest Superstock bike on the first lap with a speed of 126.075mph whilst the rapid progress of the newcomers could clearly be seen with Jamie Hamilton lapping at a very impressive 116.56mph. Jimmy Storrar and Karl Harris were also going well at 114.01 and 113.72 respectively. Luis Carreira and James Hurrell were first lap retirements but at the front of the field Martin lapped slightly quicker at 127.524mph. The men who were really upping their pace, however, were Donald and McGuinness with both breaking the 129mph barrier for the first time this week. Donald posted a lap of 129.023mph but McGuinness was again quickest at 129.411mph. 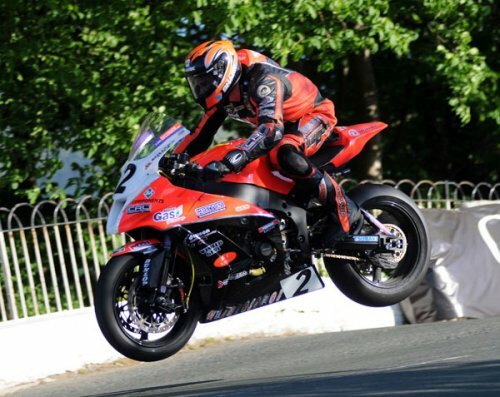 Rutter lapped in excess of 126mph whilst Kneen was again over 124mph on his Suzuki Superstock. Anstey and William Dunlop were just over 125mph on their Superbikes with Cummins improving to 121.64mph. Storrar was also improving, with a lap of115.75mph. Ian Mackman was out for the first time on the Norton and posted a more than respectable 112.36mph but the 1000cc machines only had a 35-minute session before being flagged off and it was then the turn of the Supersport and Lightweight machines, the latter having their second outing of the week. Kneen was first back at 120.006mph with Michael Dunlop, having his first outing of the year on a new R6 Yamaha at 117.784mph but it was brother William who was the quickest Supersport machine again on 122.505mph. However, Michael’s second lap was 124.65mph to send him to the top of the leaderboard but only briefly as William came back with 124.77mph. Anstey was only slightly further back on 123.68mph. Hillier recorded 111.019mph on his Lightweight machine on his opening lap and went quicker second time around at 113.21mph with Rutter, having his first run of the week on the KMR Kawasaki, a fraction slower at 113.14mph. Donald was right on their tails at 112.86mph with Manx Grand Prix winner Dave Moffitt also breaking the 110mph mark but Farquhar topped the charts at 115.39mph. 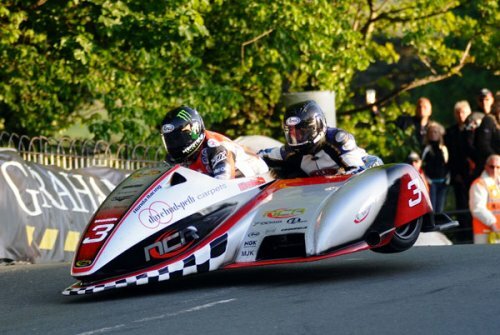 At 8.00pm the sidecar session commenced with the running order Dave Molyneux/Patrick Farrance, Tim Reeves/Dan Sayle, Conrad Harrison/Mike Aylott, Gary Bryan/Jamie Winn (replacing Gary Partridge), Greg Lambert/Stu Castles and Dougie Wright/Martin Hull. Last year’s race 2 winners John Holden/Andy Winkle left the line midway through the pack. Reeves was first to complete the lap at 112.80mph, the quickest of the week so far, with Molyneux on 109.958mph, the Manxman pulling straight in. Harrison was only slightly slower at 109.52 although he too pulled in with Bryan next quickest at 107.925mph. The session was red flagged shortly before the scheduled end following an incident at Sarah’s with husband and wife outfit the Daykins. Robin was reported as OK while Anette was taken to hospital with possible fractures. Tomorrow’s session will again see the Superbike, Superstock and Supersport classes away first at 18.20 with Sidecars scheduled to go at 20.00.